I have been building permaculture gardens, designing earth awareness programmes and connecting children to this incredible earth of ours for twelve years. Involving children in this work is probably one of the most vital learning's that can be given to them for many reasons. *Children learn by doing¦growing their own food is a practical and empowering skill that stays with them for life. In a world of high food prices and food shortages this skill becomes even more valuable. *Physical health and well being grow whilst growing gardens. Its amazing just how positively an hour outside working with nature can work for children. *Behaviour management has a valid place in gardening programmes. 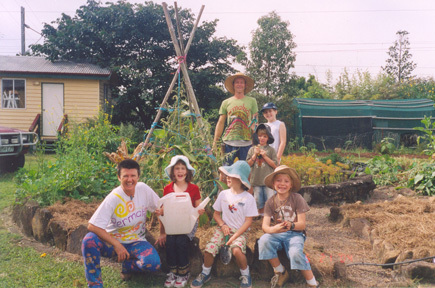 Children feel good about themselves and discover they can succeed in the garden. *Curriculum can be applied in all areas of the garden .It is a creative space, brimming with opportunity to learn language, maths, science and the arts. Perhaps the most important element of this work is that it is fun¦and children love it "so many values" why wouldn't you????? ?